I love the idea that by doing small things, you can make great things happen. I have mentioned before that I struggle with putting myself down a lot and getting angry as a mom. 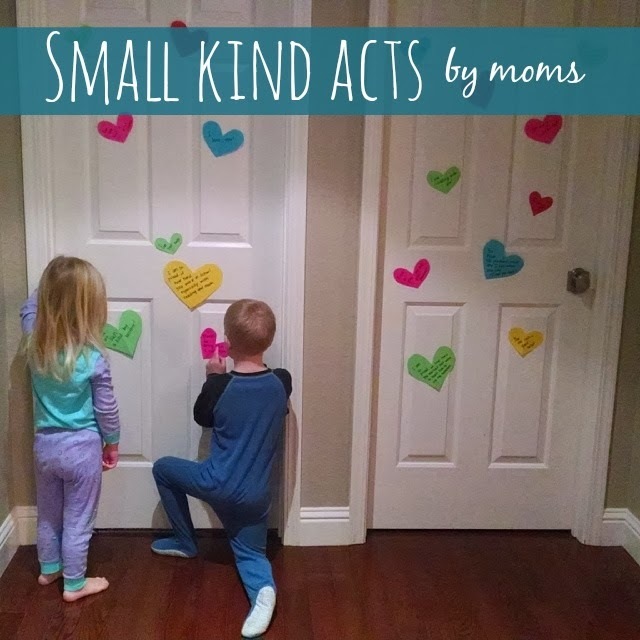 As we kicked off our 100 acts of kindness project earlier this week I realized that I spend a lot of time looking at how my kids treat each other when it comes to being kind... but I don't overly focus on what I do to be kind to them. Sometimes I feel like since my entire life is devoted to helping and teaching them (and I'm already exhausted)... I'm doing enough. Not true... at least for me. 1. I responded immediately when they asked for something. I think kids do need to learn patience and I don't need to always be helped right away... but this week I tried to be quicker than usual. I tried to say, "in a few minutes" less often. 2. 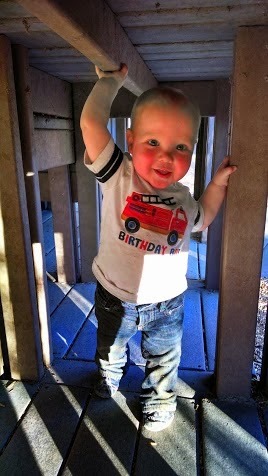 I put my phone away (and any other distractions) and I let them lead play. I just did what they wanted to do. I also tried to have at least a little Mind, Body & Soul time with each kid every day (an idea from Positive Parenting Solutions). I'm not up to twenty minutes yet, but am trying. 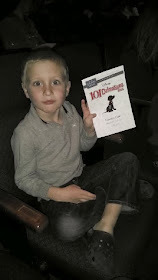 My son and I even managed to go on a "date" to a local children's theatre production & ice cream. 3. I cut out hearts and heart attacked their bedroom doors while they were sleeping. I wrote little love notes on each heart too. It was a super sweet experience to think of all of the things I love about each of my kids and then write them down. It was even sweeter to listen to my son read them aloud the next morning. You could tell his heart was happy and he felt loved. 4. 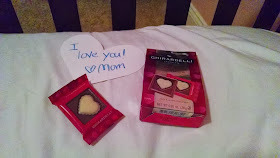 I left a little treasure on their beds with a note. Both big kids were ecstatic when they discovered a little surprise on their pillows. It reminded me of going to a hotel. Chocolate on their pillows at bedtime... what a treat! I loved listening to them try and figure out what their cards said too. Little things go a long way with little ones. My two youngest are super huggable, but this week I hugged my five year old more. I made sure that every time I said goodbye I gave him a hug. I also just randomly went up to him during the day and gave him a hug. I think he liked it... though he's not the sort to tell me. 6. I uses a kind and quiet voice. This one has been hard. I used to never raise my voice... but over the last year I have changed that and have been super disappointed in myself. I am really looking forward to Amy's Free "Get Kids to Listen Without Nagging, Reminding or Yelling" webinar next Wednesday (make sure you sign up and come and join me!). This week I tried to lower my voice every time things escalated and talk slowly and calmly. I snapped once or twice with the kids, but overall I was pretty good. I tried to remind myself that they are little, learning, and trying their best. 7. I let things go. We listened to Let it Go from Frozen a lot (my kids and I are obsessed). It reminded me to "Let it go." :) There are certain behaviors that I tend to harp on and get annoyed at my kid's about every day... sand all over the floor, fighting. clothes thrown around, crumbs everywhere, etc. I tried to let them go a bit this week... especially the arguing. Instead I focused on the good things the kids were doing... and of course I started to see those positive behaviors more and more! The highlight of the week was when my 5-year-old son came and told me how much he loves me just out of the blue. I could tell he was touched by the nice things that I said to him over the week and I think he appreciated that I was trying to be kinder and more patient. Our house was so much more peaceful this week and we had such a good time together playing, chatting, and going on little adventures. Although I am always trying to find ways to be kind to my kids, sometimes I so frazzled and busy that I don't focus on them enough. My frustration towards the kids was reduced as I did nice things for them and I felt better about myself as a mom too. These were nice and unexpected consequences of focusing on being kind. What are small and simple acts of kindness that you can do as a mom (or dad, or grandparent, etc)? Click here to read a few more of my favorite acts of kindness as a mom. You are an awesome mom. I agree with each of your small acts of kindness, but the notes on the door was the most touching to me. Your kids can save them and always remember that you love them no matter what. I'm going to try and be kinder to my older kiddo this week. I teach second and third grade, and I know the importance that voice volume has on kids. I watch them playing on the playground and they can be so silly! I am constantly finding myself reminded that they are just small children, even when they're being brats. Sometimes it helps to find something to giggle about instead of getting irritated. I love that you left treats on their bed. That was so sweet. I am going to def do that this week!